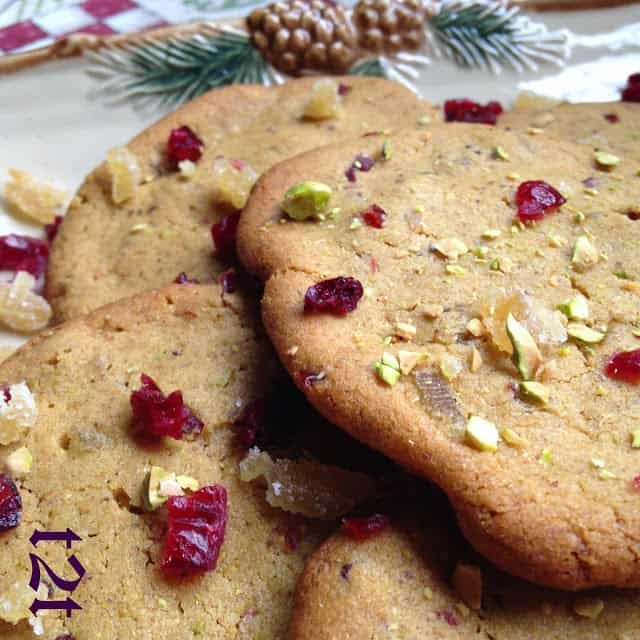 Pistachio Cranberry Crystallized Ginger Cookies are made with chopped pistachio’s, dried cranberries, crystallized ginger and almond butter. Combined together, they produce a tasty and crunchy cookie that are super delicious. If you’re a fan of ‘crunchy cookies, like I am, you are gonna fall in love with these. If you’ve been reading my blog for any length of time, then you certainly are well aware of my love for cookies and ice cream. These cookies rats right up there on my list of favorites. A while back I purchased 3 jars of almond butter at Trader Joe’s and have been on a “almond butter roll” ever since. I love peanut butter and now I’ve fallen in love with almond butter too. In my humble culinary opinion, I think I like almond butter better for baking than peanut butter. It seems to me that almond butter is more versatile and therefore can be used in more recipes. In a food processor, (set aside 3 tablespoons pistachios) grind remaining pistachios with 1 tablespoon vegetable oil. Add almond butter, combine well. Coarsely chop remaining 3 tablespoons pistachios, set aside. In a bowl with an electric mixer, combine the butter and sugar until fluffy. Add the egg yolk and vanilla. Beat in the pistachio mixture until incorporated. In a separate bowl, whisk together flour and baking soda. Slowly add to butter/pistachio mixture. 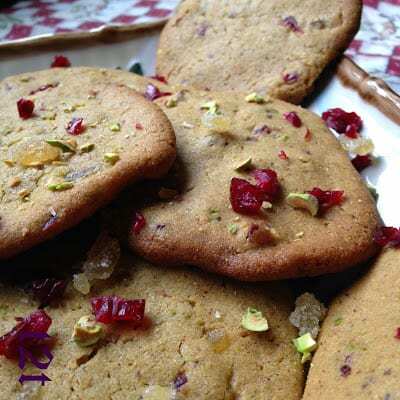 Mix in remaining pistachios, dried cranberries and ginger. Divide into a log. Wrap in plastic wrap. Chill for 30 minutes. (I chilled the dough for several hours) Slice the dough into pieces and shape or press into a circular shape. Bake at 350º for 12 to 15 minutes. 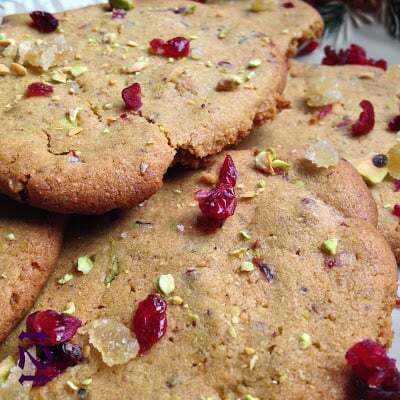 Garnish with chopped pistachios, dried cranberries and crystallized ginger, if desired. Those are such pretty cookies! I love the flavour combination as well. Crystallized ginger and cranberrys….great combo!! These look so festive!!! Great pick, Lynn, for a holiday cookie!! The cookies look delicious but I'm not sure I could make them in our house. My husband also can't leave a bag of pistachios alone :-). Great SRC post. What a great combination of ingredients! Sounds yummy! LOOOOVE crystallized ginger!! Yum! These are so cute and festive with their red and green ingredients! These look really good! 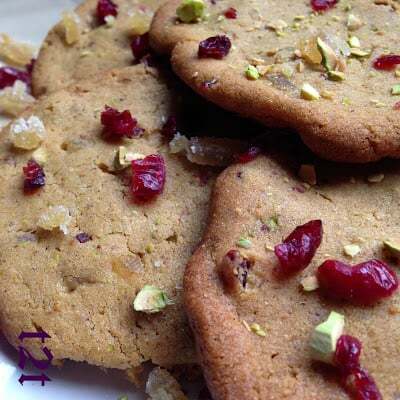 Love the combination of pistachios and cranberries. Happy Holidays! They look crispy and delicious! They look so festive – great choice! Thanks for stopping by and making my pistachio cookies. They're festive and not too sweet! I love pistachios and I JUST bought a bag of crystallized ginger. It was on sale and I knew I'd find something yummi to make with it. These cookies look like the perfect idea!